Thinking Out Loud | My thoughts about life, faith, and the world around us. My thoughts about life, faith, and the world around us. A few weeks ago I had my hearing checked because I had noticed a difference in how things sounded when I listened with my right ear versus how they sounded when I listened with my left ear. To be more precise, when I had a phone to my right ear I could not hear the lower overtones as well as I could with my left ear. As a musician, I really worried about having my hearing compromised, which would be a huge loss. As it turned out my hearing is within normal range except that I have one frequency in the lower register that I can no longer hear with my right ear. The technician that gave me the test said that it is not unusual for people to have this kind of selective hearing loss but that it was a little unusual that someone would notice such a specific loss. She said that musicians were more likely to notice this kind of loss than people who were not trained musicians. When you are a college music major one of the things that are a part of your curriculum is “ear training.” This is a combination of musical dictation, sight singing, and listening to musical excerpts, that helps you learn how to listen and what to listen for. It is this intentional program of learning how to listen that helps musicians hear what they need to when they are performing so that they can make the many minute adjustments that contribute to an artful performance. Here’s the deal: we can train ourselves to see and hear the injustices around us or we can train ourselves to ignore them. The saddest thing is not that we notice injustice and choose to ignore it (although that would be sad) but that our senses have become dulled to its presence. Okay, I’ll admit that New Year’s Day has always been one of my least favorite holidays. It generally involves drinking and crowds, two things about which I am not an enthusiast. I have often spent New Year’s Eve at home with family celebrating in the least exciting way possible – often sleeping through the changing of the year from one to another. In many ways, New Year’s is a contrived holiday, since the only reason one year changes to the next at that moment is because we say so. The calender, while it is informed by our earth’s journey around the sun, is in many ways a figment of our imagination. I do think, however, that the New Year’s celebration, in the way we understand it, is a pregnant moment. It can be a time to reflect on the previous year and give thanks. It can be a time to take inventory of the things for which we are grateful and to whisper our gratitude to the divine origin of our bounty. In a world where time often whisks by without any significant reflection it is an opportunity to live into the eternal now by reflecting on where we have been and where we are heading. Like many people, I have also had years to which I was more than happy to say goodbye. These are the years that mark serious losses or setbacks. While not wanting to wish away time it is nice to mark the finality of a season of despair and commit ourselves to a new season of hope and expectation. Without the marking of the years there are no benchmarks for our expectations and we could drift endlessly through periods of grief without a passage into a new era. The Bible talks about time in two ways. Chronos is the passage of time in the common sense of the word. Kairos is time in the sense of a moment of opportunity (often divine intervention). It is the word that is used to say it is time to act. Recognizing the changing of one year to another in the passage of time (chronos) calls us to recognize this as a moment of opportunity (kairos) to open ourselves to transformation and growth. After brunch some of our group went back to Panajachel to go zip lining. About half of the combined group (St. Mark’s UMC & John’s Creek UMC) went to San Juan La Laguna for a demonstration of local dyeing and weaving techniques and some shopping. The small shop we visited was off the main street and was run by a co-op of women who joined together to sell their wares. The demonstration was interesting and we had an opportunity to buy some of their products after the demonstration. I did have one item that I wanted to buy while we were in San Juan. It was a painting of the Last Supper. There were a couple of things that made the painting distinctive. 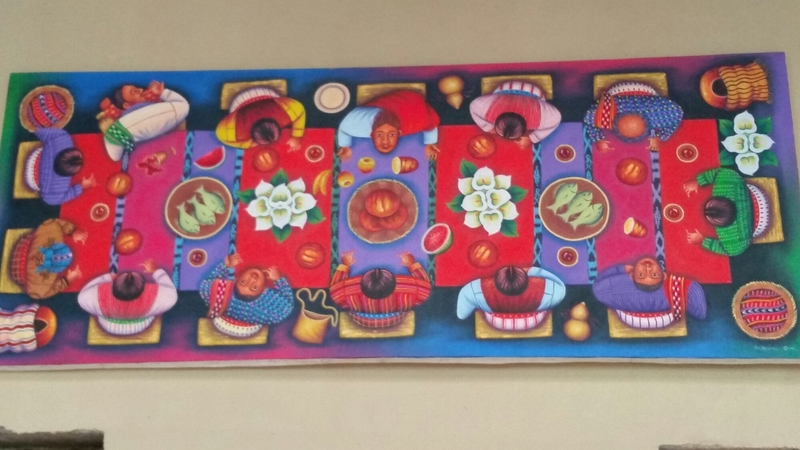 One was that the painting was painted as if looking from above, a technique that is found in many of the local paintings, especially marketplace scenes. Secondly, each of the disciples are depicted wearing the characteristic dress from one of the twelve villages around Lake Atitlán. The villages are named after the twelve apostles, so the dress from the village named after a particular disciple is worn by the disciple in the painting. I am including a photo of the painting so you can see what I mean. There is a copy of the painting in the dining room at the River House and I was drawn to it immediately when I first saw it. Tom Heaton, the director of Mission Guatemala, had told me that it was available in a certain shop in San Juan and I was delighted to successfully purchase a copy! Tonight we will have our final dinner at River House. We will rise early in the morning and head to Guatemala City to catch our flight back to Atlanta and then Indianapolis. 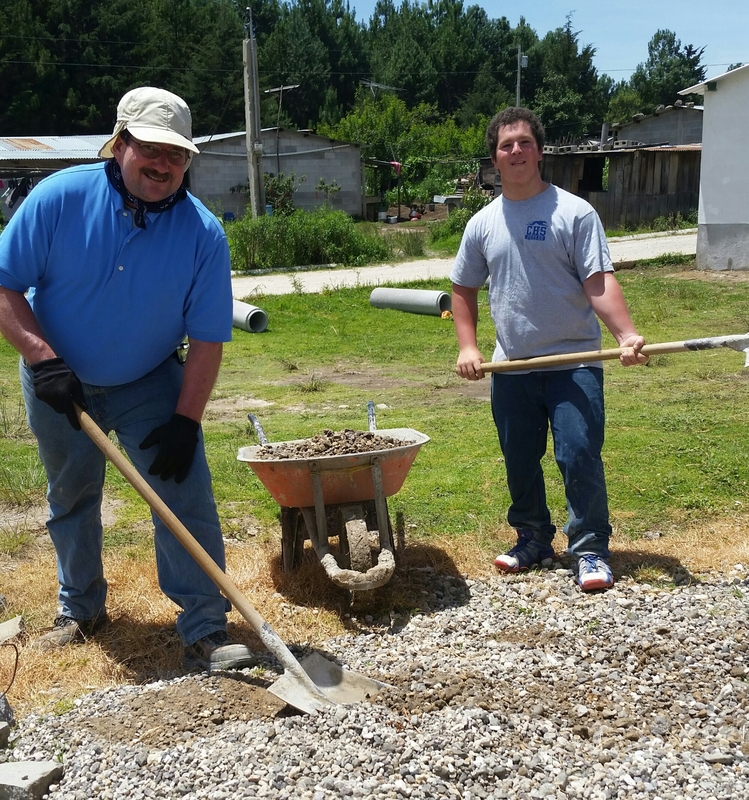 Today was our last day on the worksite at Las Canoas Baja working on the playground. We made a significant amount of progress on the playground equipment. 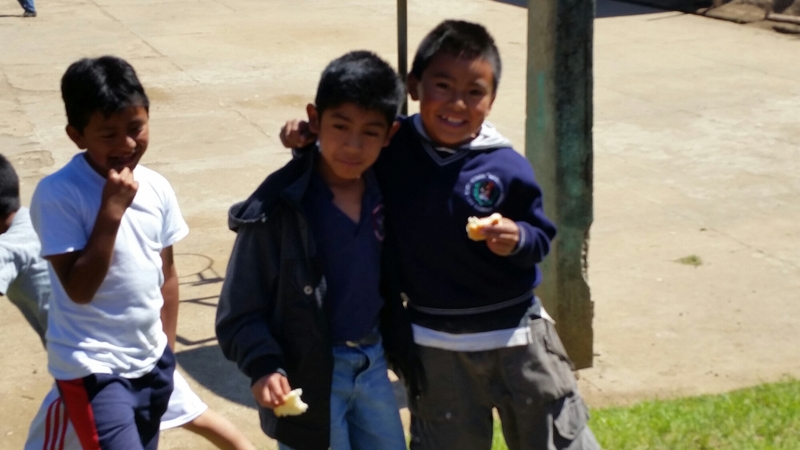 We also spent more time than usual playing with the children in the schoolyard – kicking balls, taking pictures, practicing our meager Spanish vocabulary, and delightedly listening to our small children companions as they tried out some new found English phrases. Shakespeare penned the line that “parting is such sweet sorrow” and we discovered the existential reality of that phrase today. I have been on many mission trips but I have never experienced the depth of farewell that we experienced with our local co-workers today. It was truly inspiring. His words also touched me at a very personal level. Being a parent who has watched two of his children die I know what a risky business parenting can be and I am grateful for any blessing on my progeny at any opportunity. I often worry about outliving all of my children, a worry that I have experienced as not uncommon among bereaved parents. 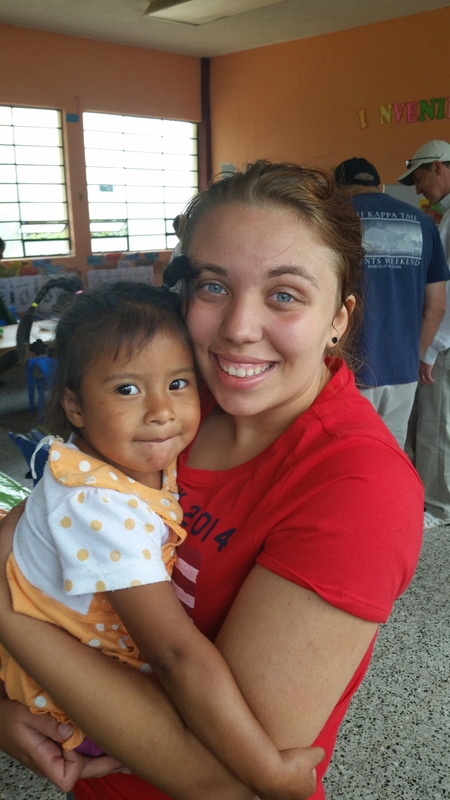 My Guatemalan co-worker had no way to know the story of my life or the losses that I have experienced. As a matter of fact, his blessing was not even directed at me personally, but to our group as a whole. Nonetheless, I felt blessed. When you lose a child there is an emptiness that is persistent and indescribable. There are, however, moments that call you back to life and hope and today I experienced one of those moments from the words of blessing in a language I couldn’t understand, translated by a friend I had met only a few days earlier. When I remember this trip I will remember many things. I will remember the warm fellowship of our team. I will remember the kinship we have felt with our companion team from Georgia. I will remember the passion and competence of the leaders and staff of Mission Guatemala. 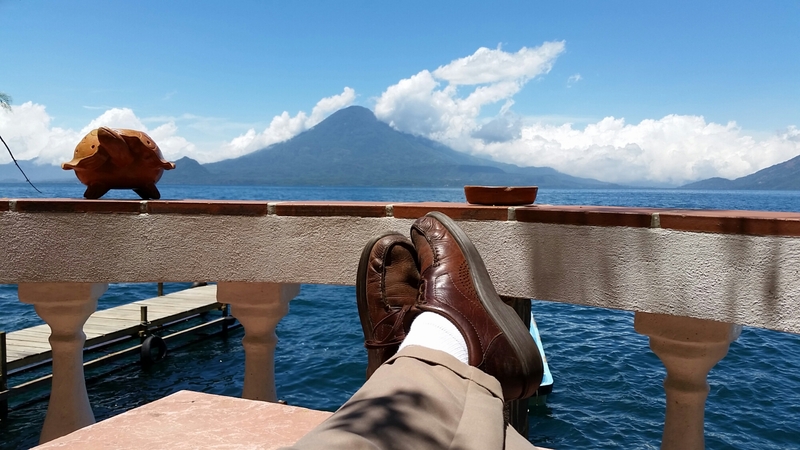 But I suspect my future remembering of this week will be defined by the reality that while my intention was to be a blessing to our neighbors in Guatemala I instead found myself the recipient of an indescribable moment of blessing – not just as a team member but as a father. After finishing the floor at the kitchen at Nueva Victoria we moved on to begin work on a playground at the school in Las Canoas Baja. This school has over 325 elementary students with fifteen teachers. When we arrived at the school they called a student assembly outside in the cement plaza. The principal introduced all the students and had each of us introduce ourselves. This has been the pattern everywhere we have been this week. There have been formal introductions and welcome rituals. It is heart warming to be welcomed with such joy and enthusiasm! We spent most of Wednesday afternoon digging post holes in preparation for the construction of a wooden playground structure – slide, swings and jungle gym. As per usual, by the end of the day we were tired and dirty but we did get a lot of holes dug. I spent most of the morning in a truck with Dave Burns who, along with Tom Heaton, is one of the primary forces behind Mission Guatemala. We spent the morning getting a small cement mixer to the our companion work site (yes, they got a small electric mixer making us a little jealous) and picking up a truck full of lumber to be used for the playground equipment. After we arrived back at Las Canoas Baja our team unloaded the lumber and moved it to a second story room at the school where it would be stored until we needed it. 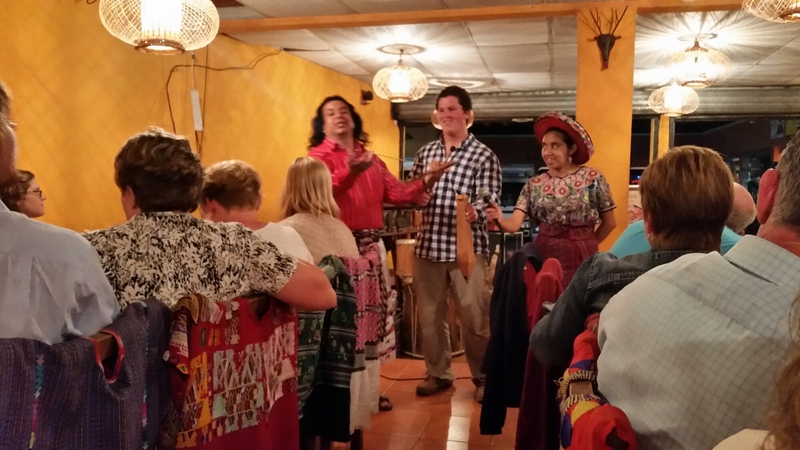 On Wednesday night we had an evening shopping in Panajachel and then a nice dinner at a restaurant where we enjoyed great food but also some wonderful cultural entertainment. The entertainment was provided by the owner of the restaurant and his family. His three daughters played marimbas with renditions of traditional Guatemalan tunes. We had a hands on course in tortilla making which included a tortilla making contest. Then the owner shared some history of Guatemala along with some stories about faith and traditions in Guatemalan culture. It was an entertaining and satisfying evening. 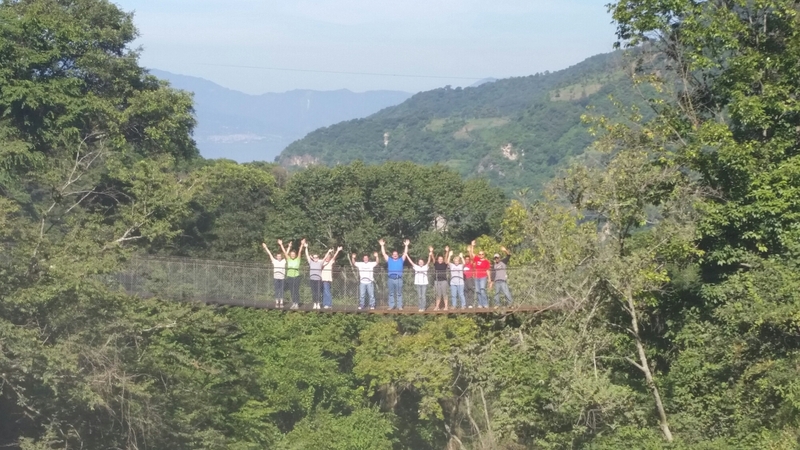 On Thursday morning we began with a little adventure by walking across a suspension footbridge that crosses a beautiful ravine. It was absolutely gorgeous. In the morning we finished digging holes and then began constructing our first section of playground equipment. It was in the construction of this equipment that we encountered a developing world problem. Although we had a nice power drill at some point someone had lost the chuck key which allows you to tighten the drill bit. In America replacing this would require a five minute trip to the hardware store for a part that would cost a couple of dollars. However, we weren’t near a hardware store and even if we were it is not likely that their meager inventory would include what we needed. So a job that could have taken a lot less time and had a lot less frustration was stifled because of the lack of a chuck key. We were able to set the first section of the playground which involved mixing more concrete. It was gratifying to see some visible progress and we look forward to tomorrow’s work. We have a constant parade of onlookers from the children at the school and several of our younger team members have enjoyed playing schoolyard games with them. A particular favorite is “The Hokey Pokey” which one of our team knew in Spanish. It is a joy to watch! There are many details I am sure that I am omitting but suffice it to say that we continue to find God’s presence manifest wherever we go and have found the people of Guatemala to be warm and welcoming. In a lot of ways it is easy to describe today in one word – concrete! We spent most of the day mixing it and pouring it as we completed the floor in the kitchen at Nueva Victoria today. We still have to complete a section of sidewalk/porch for the kitchen in the morning but we did a lot of work today and we were all really dirty and tired at the end of the day. Needless to say, by the end of the day we had concrete from head to toe and we were very tired. However, we were also very satisfied with the job we had done! We began our day today by passing out coloring books and crayons that we had brought with us from Indiana to the students at the school where we are working on the kitchen. The children were thrilled with their gifts and several of the classes sang for us. Our translator and guide from Mission Guatemala, a young man named Diego, introduced us and played games with a couple of the classes and we all thought that watching Diego interact with the children was a real treat. We are really enjoying our time with Diego and we all think he is a blessing to us and we are grateful that Mission Guatemala has him as one of their staff members. It was a productive and joyful day! As a final note I want to mention that I will not be blogging tomorrow night. On Wednesday nights the work teams here at Mission Guatemala go into Panajachel, the town in which we are staying, and have dinner at a nice restaurant. Today was a busy day for us. We met for prayer before breakfast and after breakfast we traveled to the medical clinic for a short tour of the clinic and the preschool there. The clinic includes a pharmacy, a dental clinic and a general medicine clinic. We met the doctor enjoyed hearing about the many ways Mission Guatemala is able to impact people’s lives through healthcare ministries. Personally, it was fun to see several hundred boxes of food from Kids Against Hunger since our church is part of a big packing day with Kids Against Hunger every year. As always, though, it was the children who stole our hearts. During our brief visit at the preschool adjoining the medical clinic we enjoyed interacting with the kids. I was a big hero with one little boy when I took his picture and then showed him the picture. He wanted to swipe the screen so I loaded a game and he immediately started playing the game. I was obviously not the first person to introduce him to a smart phone! Our group from St. Mark’s traveled about 45 minutes into the mountains to work at a small village that had been displaced a few years ago by hurricane damage and had moved en masse to the mountains. To get there we had to travel by a gravel road up one mountain, down another, and back up again to a height of over 8,000 feet. A couple of people in our group worked with a dentist who was there for the day to do tooth extractions. We were all impressed by the courage of the kids and the support of the families as the kids had their examination with the dentist. Many of them had very poor dental hygiene which is sad. As part of the examination each patient was given a toothbrush and a large tube of toothpaste. The majority of our group worked on finishing a new kitchen for the school. The old kitchen is basically a fragile wood and tin structure with an open fire inside. The new kitchen consists of a sink with running water, a large preparation table, and two wood burning stoves in a cement block structure. Our job today was to plaster the outsides of the stoves and preparation table and to prepare the dirt floor for a new cement floor as well as preparing an area in front of the kitchen for a sidewalk/porch. We finished most of the plastering and preparation and hope that we will be able to pour the concrete floor and porch tomorrow. The drive to and from the village was a little adventurous as it involved a lot of switch backs on gravel roads with no guard rails. We are very thankful for our driver who navigated the roads with a lot of experience and confidence.